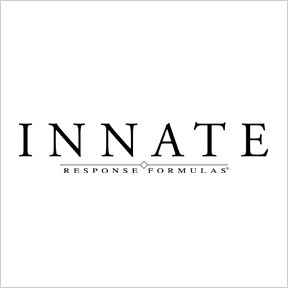 Since 2003, Innate® Response has developed and manufactured carefully formulated, plant-based nutritional supplements intended to strengthen and support the body’s own innate healing responses. Based on the premise that the human body is brilliantly designed for homeostasis, Innate® Response formulas utilize FoodState Nutrients™ to promote a healthy, harmonious state of balance and support the health and wellbeing of the whole person. Innate® Response integrates modern nutritional science with the time-honored wisdom of whole foods and traditional herbs to formulate therapeutic solutions that the body naturally recognizes as food. These formulas include a full spectrum of cofactors as they occur in nature to stimulate the body’s innate capacity to identify and utilize nutrients efficiently. All raw materials and every finished product undergoes in-house testing for purity, identity, and efficacy. Highly respected third-party organizations validate the quality assurance of Innate Response’s in-house laboratory, ensuring all products are free of pesticides, herbicides, microbes, allergens, and heavy metals. Innate Response guarantees that their products deliver broad-range, high quality synergistic whole food nutrients and assures the highest level of quality and integrity. Digestive Enzymes Clinical Strength: This comprehensive clinical strength formulation delivers a powerful blend of digestive enzymes that support the improved digestibility of high fiber fruits and vegetables, as well as support for multiple stages of protein, carbohydrate and lipid digestion. Gluten, soy, dairy, and sugar free, vegetarian formulation. Adrenal Response Tablets: This non-glandular, clinically studied adaptogenic herbal blend is formulated to support a healthy stress response, maintain healthy cortisol levels, and reduce stress. Gluten, soy, sugar and dairy fee, vegetarian formulation. Vitamin C-400: This premier, biologically-active synergistic compound provides a superior source of naturally buffered, organic whole food vitamin C. For overall wellness support, an immune blend along with bioactive enzymes and protein round out the formula. Gluten, soy and dairy free, Non-GMO vegetarian formulation. Vitamin D3 5,000 IU: This expertly crafted, comprehensive blend of whole food vitamin D3, as highly bioavailable cholecalciferol, vitamin K1, and vitamin K2 provides synergistic nutrients to support key bodily functions, as well as cardiovascular, bone and overall health. Gluten, Dairy and soy free, Non-GMO vegetarian formulation. One Daily: Suitable for a wide variety of nutritional needs, this foundational daily formula is crafted exclusively from select whole food concentrates providing a comprehensive spectrum of essential nutrients necessary for optimal heath and vitality. This gentle on the stomach once daily formula provides essential vitamins, minerals, trace minerals, phenolics, probiotics, antioxidants and an immune supportive nutrient blend. Gluten, dairy and soy free, vegetarian formulation.